Anywhere the eye can see, it’s likely to see an ad. Recently, even eggs in a supermarket were found to be stamped with television show names! Experts estimate that an average person is exposed to over 5,000 ads a day. But let’s be honest – no one wants to be marketed to. Therefore, it becomes all the more crucial for marketers to be relevant and helpful to customers. According to a study, 71% of the customers prefer ads that are tailored for their interests and shopping habits. 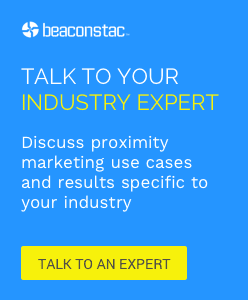 At Beaconstac, we believe that beacon marketing notifications should be helpful and not spammy – pull rather than push notification. 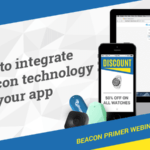 And in this blog post, we will talk about how to get the beacon messaging right. Consumers today are impatient and have short attention spans. So it is important not to overwhelm users with large chunks of information. Try keeping the text to a minimum, conveying only the key messages you want to share. However, sometimes it can be difficult to achieve this when the information that you want to disseminate is lengthy. Instead of inserting a large wall of text within the same campaign, you can slice the information into chunks and broadcast your message through a series of markdown cards. This sequential markdown card approach is an effective way to engage your user while providing a substantial amount of information. In order for your campaign to be effective, it has to matter to the user at that specific point in time. This means that you have to target the right user in the right situation. When crafting your campaign you should consider the kind of audience that is going to witness it. For example, if you are targeting a younger demographic, then a campaign with GIFs and memes can resonate well. However, this same strategy would yield poor results with an older demographic. Businesses tend to talk a lot about their brand stories. Most customers have a basic acquaintance with your brand if they are at your store. In contrast to generic campaigns, effective in-store marketing focuses on the stage of purchase journey. For example, push out a welcome campaign when customers enter the store, offer discounts and coupons when they are in an aisle, and finally encourage them to return through loyalty codes when they are exiting the store. If you are able to garner even a small amount of interest from the user through your campaign, it is important that they do not lose that interest. So it is crucial to ensure that they are immediately offered the opportunity to act on that interest. This is why call-to-actions (CTAs) form an essential part of your campaign. In addition, you should label your CTAs in a manner that is engaging for the user and motivates them to take further action. A user is more likely to click on a CTA labelled “Avail offer now!” than one labelled “Ok”. If not crafted thoughtfully, campaigns can often come across as “spammy” to the user, and as a result, are instantly ignored. To avoid this appearance, plant your brand title, logo, and contextually relevant information, such as the city or locality name on your beacon push notification. When such information precedes the actual offer, it can establish a sense of credibility to your campaign, and gain trust in the eyes of the user. Your in-store marketing strategy should be consistent across all platforms you wish to advertise on. It can be confusing and distracting for a consumer if they encounter completely different and unrelated messages on a digital signage, beacon campaign and physical poster. Conversely, if all platforms are in sync, following a specific theme, this can really enhance the in-store experience and catch the attention of the customer. Finally, visual appeal is a major deciding factor when a customer is confronted with a campaign. There are several guidelines that you can follow that can instantly enhance the user interface of your campaign. It is most definitely true that pictures are worth a thousand words. Use meaningful images to avoid conveying messages through text. Effective pictures can plant ideas in the mind of the consumer. For example, if you are trying to convey that your product is time-saving and efficient, an image of a person relaxing can be more convincing than a picture of the product itself. It removes the need of having to explain the utility of the product. The top fold of your campaign should include the CTA button, so as to ensure that the user does not miss out on the chance to take immediate action. Since the CTA is the most important part of a campaign, make sure that it is clearly visible in the form of a button and not just a section of underlined text. Moreover, the buttons should be a finger-friendly size, so that they are easily clickable. Colours can make your campaign look more enticing and appealing. Make sure that you use contrasting colours to highlight your buttons and text. Users should have no difficulty in understanding what the campaign says. If you are using a beacon-based app, use splash screens to plant the right expectation that you want the user to have, before they see your campaign.